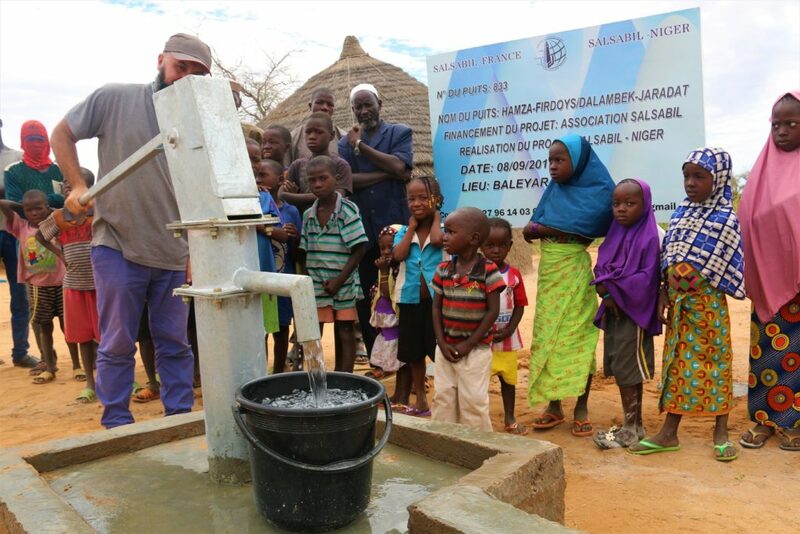 Building wells for Africans has been among the very first projects of our association. It is a continent that has the biggest need for water on Earth and the amount of wells that we have built since 2013 is getting close to a thousand. With the mercy of Allah, more than 100 thousand of people from 4 of the most needy african countries obtained access to water. The prayers of the people in Togo, Benin, Niger and Somalia rise up to Allah and are written down in the book of good deeds of the people who have financed the construction of these wells. This trustworthy Hadith of our Prophet (ﷺ) that says: “The best form of charity is giving someone water (to drink)” shows the great reward for such an act. The donators to such charitable deeds are from different countries and maybe even of other faith. We receive donations from Europe, Russia and its surrounding countries. The money may be meant for an entire project or for a part of it. If an individual order is placed, we may name the well after the sponsor, but if such a wish was not expressed, we name the well after a companion of the Prophet (ﷺ). The price of a well varies depending on the country. To fully understand the reasons for such variations, below you may find the necessary information. You may donate to the well project of Salsabil in the manner that is the most comfortable for you. To do so, simply click on “donate” in the website menu in the top right corner, choose a “purpose of donation” and a “payment method” that will suit you best. We ask Allah the Almighty to accept your donations and our efforts. It is only in 2017 that we began building wells in Chad. Due to tremendous needs, we ask our sponsors to pay attention to this particular country. Here, people cross dozens of kilometers in search for clean, drinking water. We have already built our first wells in this country. Unfortunately, their price is higher than in western Africa because of the methods of construction and the great depth of the groundwater reservoirs. The first well built by Salsabil in Benin was in 2013. The access to drinking water is very difficult there. Those who are most in need are regions that are far away from the capital city, where international NGO ‘s have a hard time traveling to. With Allah’s mercy, we managed to get a collaboration with one of the local charitable organizations with the goal of building wells in the northern part of the country. The wells are being dug with hard labor – using hands and shovels. Sometimes the depth may hit 25 meters. Within the last 3 years, you, our sponsors, have financed, and we have built, with the help of Allah, 117 wells in Benin. We all provided clean, drinking water to 69 localities with a population of 30 thousand people. May Allah accept from all of us! Statistically, the average income in the Togolese Republic represents 900 dollars a year. It seems needless to say that with such a financial situation, this country is unable to create any kind of infrastructure. The need for clean, drinking water is urgent and the access to it is scarce. In 2014, donations were made so we could build 24 wells in Togo. In the next 2 years, with Allah’s mercy, the amounts increased significantly, praise be to Allah the Almighty! Within 3 years, we have built over 130 wells in Togo. They are also dug with bare hands, but we praise and thank Allah for giving us all the opportunity to help His slaves who are deprived of the most essential element of life. Niger is one of the biggest countries in Africa where Salsabil is actively working. People live in difficult, socially unacceptable conditions and the access to clean, drinking water is also severely limited. We are building wells in Niger since 2014. Praise be to Allah, we have already established more than 100 wells in this country. In the region of Dosso, which is part of our project, there are over 2 million people. The wells are dug until we reach the groundwater reservoirs that are admissible for drinking and for sanitary needs. The usual depth is between 10 and 15 meters. The average time of construction of a well in every country where this project is being executed, does not exceed 4 months. Their depth may go up to 25 meters. From the moment we receive the full amount, every well gets a unique ID. Then, as soon as the well construction has ended, we upload a report video on our YouTube channel. If you wish to watch one, you may refer to the bottom panel of our website, and search in « Find your well » by indicating your well number. Additionally, if you wish to have a written report about your well, you may request one by contacting us (you can find a report example here).